An instrument set that almost anyone can master. Its top quality construction, accurate intonation, and easy-to-grasp handles make this 8-Note Handbell Set the best value available. C-C range. 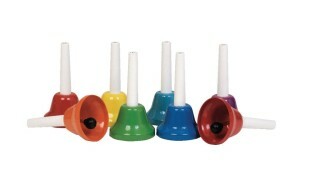 Each of these eight 5" metal bells is marked with the proper note, making it easy for anyone to learn the musical scale. Our residents really enjoy them. The product is sturdy the sound is great not too loud the colors are perfect it's easy to play I orchestered a song with my kindergarten in about 10 minutes. I love the bells. I have been asking my husband to purchase them for me since Sept. and he didn't agree until a few weeks ago. I just received them todayNov.14th and he's been playing with them and enjoying the beautiful sound they make.I sure wish I could've gotten them sooner so that the Ladies Ensemble group at our churh could've had time to learn to use them for our Christmas bookings. I will start them at the first of the year to use them for Easter. Thanks Just Me Lana Snowden/ Kingsport Tn.